HISTORY: Near Bob's hometown in Pennsylvania, there was a town park that had a real carrousel ride. This sculpture is dedicated to the memory of good times years ago on the carrousel. GENERAL: The horses used in the early carrousel came from rocking horses with their rockers removed. This explains why all four feet are off the ground and are the same height. The decoration in back is of the type that normally would be found on a carrousel from that early period. The simple pattern of the straps and bridle also was typical of that early design. The two children represent Bob's own son and daughter. How characteristic of children as they pass by to wave at their parents. The first four figurines in the Americana Series were more artistically serious works with two western, an eastern nautical, and a turn-of-the-century New York sculpture. Bob wanted to address a lighter side of our culture to provide a balance to the series. He wanted another typical American scene, but one with lightheartedness. Such a change would also open the path to his work the next year featuring John Philip Sousa. 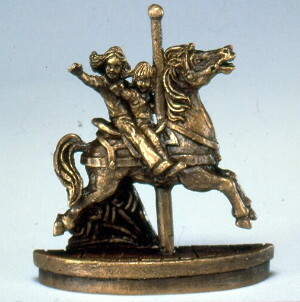 This figurine and the painted "Carrousel Days" are similar in overall appearance but much different in message and in many details within the sculpture. For a comparison, please refer to the description of this later 1987 sculpture. The figurine tends to tip over due to the shape of the base. SIGNED: On the bottom of the base with a full "Robert Olszewski" in script.